She is co-editor-in-chief of the international journal Cahiers Élisabéthains (Sage). She has published a number of articles on insults, the evil tongue and the war of tongues in Shakespeare’s plays. She published The Unruly Tongue in Early Modern England, Three Treatises, Fairleigh Dickinson, 2012. She is the author of Shakespeare’s Insults: A Pragmatic Dictionary (Bloomsbury, 2016). She co-edited (with Claire Gheeraert-Graffeuille) Autour du Songe d’une Nuit d’été (2003). 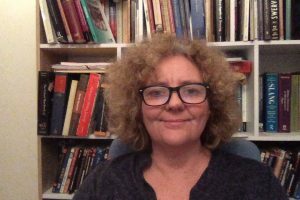 She co-edited (with Sarah Hatchuel) Shakespeare on Screen: A Midsummer Night’s Dream (2004), Shakespeare on Screen: Richard III (2005), Television Shakespeare: Essays in honour of Michèle Willems (2008), Shakespeare on Screen: The Henriad (2008) and Shakespeare on Screen: The Roman Plays (2009), Shakespeare on Screen: Hamlet (2011), Shakespeare on screen: Macbeth (2013), Shakespeare on Screen: Othello, Cambridge University Press (2015), Shakespeare on Screen: The Tempest and Late Romances, Cambridge University Press (2017). She is co-editor, with Patricia Dorval, of the Shakespeare on screen in francophonia database. She is co-general editor of the open access online journal ASF, Arrêt sur scène/Scene Focus. She is the coordinator of the European Programme (2016-2019): “New Faces: Facing Europe in Crisis: Shakespeare’s World and Present Challenges”. Nathalie Vienne-Guerrin’s centers of interest are: Shakespeare; Shakespeare’s world; Shakespeare on screen; Shakespeare’s language; crises in Shakespeare’s world; Shakespeare in relation to the present; Elizabethan culture and literature; Elizabethan culture and literature in relation to our present day; speech acts, insults from the Elizabethan times to the present; the representation of crisis in Shakespeare’s world; the representation of migration in Shakespeare’s world; linguistic approach to Elizabethan migration; migration on the Elizabethan stage. Nathalie Vienne-Guerrin will co-supervise one MOVES research project: “Myths of Migration and Their Significance in Past and Present”.